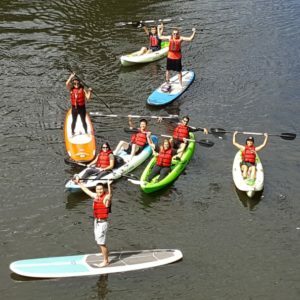 Stand up paddle surfing, or SUP, is a surface water sport, a variant of surfing where the surfer uses a paddle to move through the water while standing on a surfboard. Stand up paddle surfing is derived from its Polynesian roots. The Hawaiian translation is Ku Hoe He’e Nalu; to stand, to paddle, to surf, a wave. The popularity of the modern sport of SUP has its origination in the Hawaiian Islands. In the early 60’s the beach boys of Waikiki would stand on their long boards and paddle out with outrigger paddles to take pictures of the tourists learning to surf. This is where the term “beach boy surfing” originates, another name for Stand Up Paddle Surfing. 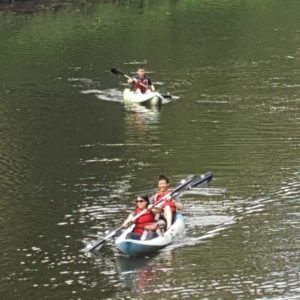 We offer single and two person kayak rentals in all of our Bothell and Kenmore locations. Our two person kayaks are great for two adults and one little one. The sit-on-tops kayaks are the most popular and are easy to get in and out of. We supply the paddles, personal flotation devices for all rentals, and a brief instruction on how to operate the watercraft. The Bothell Landing & Log Boom Park in Kenmore has canoes and beach cruiser bikes that are also available. Must be 18+ to rent. Reservations accepted only for groups over 12. The combo adventure is perfect for those seeking an extended paddling experience! 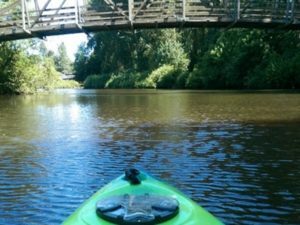 Your day will begin at our Bothell Landing location, where you will paddle the Sammamish River. 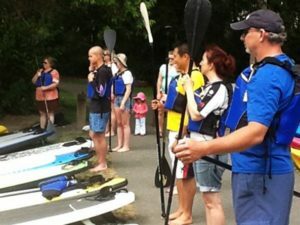 You will end your paddle when the river merges with Lake Washington at our second location, Tracy Owens Station at Log Boom Park in Kenmore. You will then jump on a Beach Cruiser Bicycle and pedal back to Bothell Landing VIA the Burke Gilman Trail. You will have 4 hours to complete this round trip adventure.